What are the top landmarks in Cape Town? Nothing says holiday like spending a lazy day at Camps Bay Beach, a popular beach in Cape Town. Stroll along the seaside or visit the shops in the area. Cape Town City Centre is a welcoming neighbourhood with many tasty options for cafes, restaurants and bars. Many visitors come to enjoy the natural beauty of the mountain views, while others visit for the local shopping. Bring the kids to the playgrounds and cafés in this dynamic, rejuvenated coastal area in the shadow of a mossy mountain. 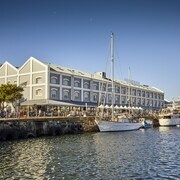 A welcoming neighbourhood, Green Point offers a variety of options for restaurants. Broaden your horizons with some local shopping. Browse stalls and enjoy live music in the harbor market, trek along the mountain trails and surf atop Atlantic swells. 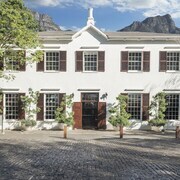 Constantia is a welcoming neighbourhood. Part of the neighbourhood’s charm is its natural features. Many visitors come to enjoy the natural beauty of the gardens. 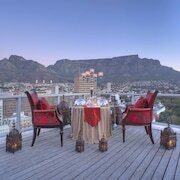 Located in Sea Point, this hotel is 2.9 mi (4.7 km) from Signal Hill, and within 6 mi (10 km) of Lions Head and Table Mountain. Cape Town is South Africa’s biggest city after Johannesburg and seat of the Parliament of South Africa, making it one of the country’s three capitals. Cape Town makes a beautiful, sunny holiday destination, with is grand harbour, incredible natural surroundings and majestic backdrop, overlooked by Table Mountain. If you’re interested in nature and history then Cape Town, South Africa is perfect. Get close to natural wonders like Table Mountain National Park and use it as a base for a safari trip to see all the incredible wildlife the region has to offer. 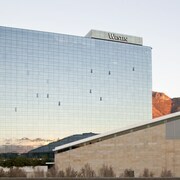 Many also travel to the city on business to take advantage of its thriving economy. There are plenty of top Cape Town hotels close to the airport, offering convenience for businesses travellers on whirlwind tours. No matter what the purpose of your visit to Cape Town, Expedia has the best deals on hotels in Cape Town, whether you’re after a budget break or a top notch luxury getaway. With blistering sun all year round, why not book a wonderful hotel in Camps Bay where you'll be close to the stunning Camps Bay Beach. Or you could stay in one of the hotels in the Southern Suburbs and check out a show at the 3 Arts Theatre, the oldest theatre in the city. If you’re into rugby, book a hotels near Newlands Rugby Stadium and take in a match – nothing beats seeing the sport live. There are also many waterfront hotels lining Clifton Beach, a local hot spot for swimming and water sports. 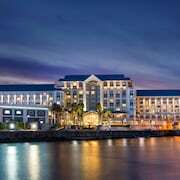 With plenty of budget two and three star Cape Town hotels, many of which are on the beach, holidays here are within everyone's reach. For business travellers, there is a great selection of four star and five star hotels located in the downtown area, close to the city's convention centres. Why not book yourself a spa hotel to make sure you don’t work too hard, making mixing business and pleasure easy. 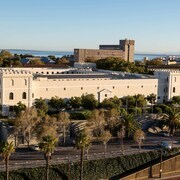 People travelling for work should also take a little time out to visit some of Cape Town’s museums too, like the District Six Museum and the Cape Town Diamond Museum. Regardless of where you stay in Cape Town, from one of the city's resorts to the lovely boutique hotels, Expedia has you covered for the best deals in Cape Town. Want to see more of what South Africa has to offer? 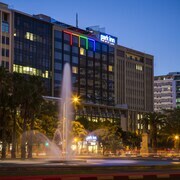 Check out our Johannesburg hotel deals. Explore Cape Town with Expedia's Travel Guides to find the best flights, cars, holiday packages and more! Flights from Kos Island Intl.